I know a bunch of you watch Lost and that you all might agreed the Desmond episode was highly emotional and probably one of the most tear jerking so far. Well that was true before last week’s episode, Ji Yeon. My butthead husband figured it out about 15 minutes in, so I didn’t have that fuzzy “Oh I’m so stupid to not have figured it out!” feeling. That didn’t matter though, I still cried my eyes out. I’m not sure if it’s because Sun is Asian and that makes me identify with her more or something, but damn did that scene break me down! I even watched the ending again last night just to find out if it was still that raw and sure enough, Niagra Falls again! I agree. I thought the waterworks couldn’t plumb any deeper than they did than when Penny and Desmond finally connected, but Sun’s visit to Jin’s grave was devastating. Regardless of ethnicity, I think the tragedy and loss was simply human. Kudos to Yunjin Kim for a heartbreaking performance… but yes, the music is key. Indeed, the song you like is from Season 1. Titled “Life and Death,” track 20 on the “LOST” season one oundtrack. It surfaces only for very special occasions, and the moment it started playing, there was no question as to Jin’s fate. You can buy the track on iTunes. It might get your eyes misty even without a scene from “LOST” in front of you! Or, here’s a guy on YouTube who learned to play the “Life and Death” theme by ear. Just beautiful. Ohh! That is a really cool video! I hadn’t realized it was from S1 too. I have high hopes for this Thursday! And woo, no Jack episode yet. Hi! First time commenter, but I love the blog. 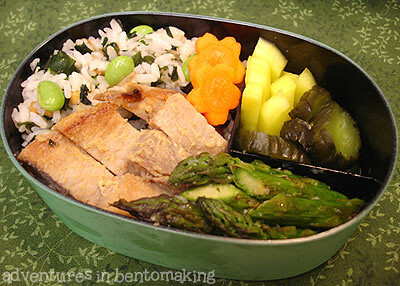 It’s inspired me to get my own bento and pack nicer lunches. Anyways, if you want to join WW for the food tracker, you should look at sparkpeople.com first. It’s a free website, well run, with food and exercise logs, message boards, etc. I’m a broke grad student and it’s helped me lose almost 20 pounds so far. When I was starting on my weight loss plan my instructor told me to not obsess about my weight but pay more attention to how my clothes fit. So don’t worry about the weight! Try on the dress and get toned. I haven’t seen this ep yet cause I was on evenings…I did hear that Jin had died though. How sad that he didn’t even see his daughter born! That is worse than the week before. I can’t wait to watch it tomorrow in Pop Up Lost format.